Spring and Summer Massage – At the top of Your Un-do List! As you plan trips, happy projects and fun for summer breaks and vacations — put Massage on your ‘undo’ list! Undo stress, undo knots, undo tension, undo time pressures. Release chronic muscle aches and over thinking. Give your body and mind a vacation with peaceful, relaxing touch through professional massage! Think of it as another step to look your best on vacation or stay-cations! Feeling our best, feeling open and relaxed – allows our inner glow and true beauty to shine fiercely through! You deserve to relax! Schedule a massage — Feel and Be radiant! Enjoy a little warmth with your massage! Most of us enjoy the relaxation and relief that heat provides tired or sore muscles. With each massage I include a warm pack for the back while legs and feet are massaged and I incorporate warm, moist towels for the neck, face and feet. Of course you may choose to leave these steps out, but if you like them they are included for maximum relaxation. 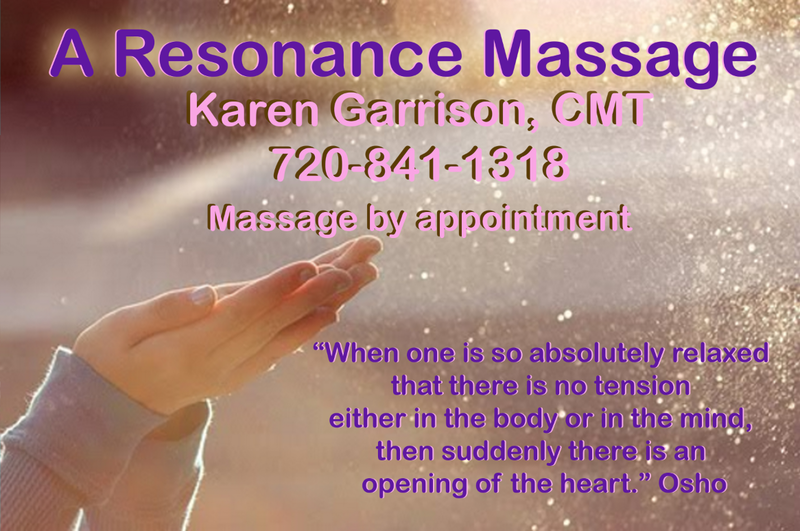 Schedule your next massage soon! Gift Certificates are available and Mother’s Day isn’t far away!